Even the casual observer needs to pause and give Huawei its due kudos for sheer nerve as it recently—if accidentally—dropped word of its upcoming Huawei Watch. An Android Wear device, it's not so much the oddly on-the-nose name or its operations that's unusual, so much as it is its multiple versions and impressively high price tag. The device was expected to be seen at the IFA 2015 show starting September 2, according to a Twitter post, and an Amazon listing was also spotted showing four different version of the device. One version started at a hefty though not out of line $349.99 for a stainless steel version with a serviceable yet stylish leather strap, but quickly went up from there, adding gold plating sufficient to raise the price to $799.99. Another two versions are between these extremes, with a black stainless steel version with matching band in at $449.99 and a gold-plated edition with a leather strap for $699.99. That might be a bit of a puzzle in its own right, but hearing more about what the device can actually do suggests that it might be ready to earn that hefty price tag. It's not only an Android Wear device, but reports also suggest that it's compatible with iOS version 8.2, or later. Some have suggested that this unexpected note may mark confirmation of earlier reports that put Android Wear as being compatible with the Apple iPhone, a strange development. Others, meanwhile, have suggested that the listing could be a mistake in its current form. 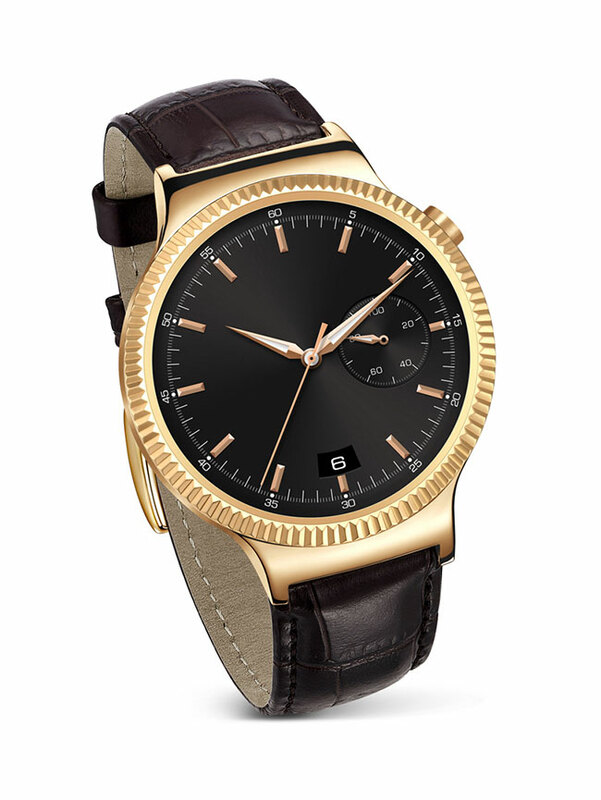 Puzzles aside, the Huawei Watch has quite a bit going for it. The watch comes with a highly-detailed fitness tracking system that can track whether a user is walking or running, tracking heart rate in both current and average, steps taken, and calories burned. The system boasts 1.5 days of battery life as well as a fast-charging system that can bring the device to 80 percent charge in just 45 minutes. A set of notification tools are on hand as well, and the ability to use many common apps directly from the watch itself. Even Google Now is on hand, offering its own boosts of efficiency to the user. With the device set for a September 2 launch date, we can expect to hear plenty more about this smartwatch very soon. There's no denying that the watch has a certain high-end quality to its look, and given that it's a Huawei device, it might well be focusing a lot of its attention on the Chinese market. Given the recent upheaval in the Chinese stock market, though, it might not have as many takers as it would have had even six months ago. There's certainly no shortage of features included with the Huawei Watch, and it might do well in the lower end of the pricing scales. But considering the sheer number of wearable devices out there already, Huawei going for the upper end of the experience may not pay off. It's a noteworthy strategy, and a sound enough device, so there's really nothing left but to do but watch and learn. Huawei might be over-reaching here, but it may well catch a star in trying to reach the moon, so to speak.